DUNN - Anthony "Biff" Graham, a 20-year veteran of the U.S. Air Force, is following his dream. Within a year from his military retirement, Graham made the decision to attend the Central Carolina Community College Barbering program. "It was the perfect career move because of my old school personality and my ability to speak to the public," said Graham. 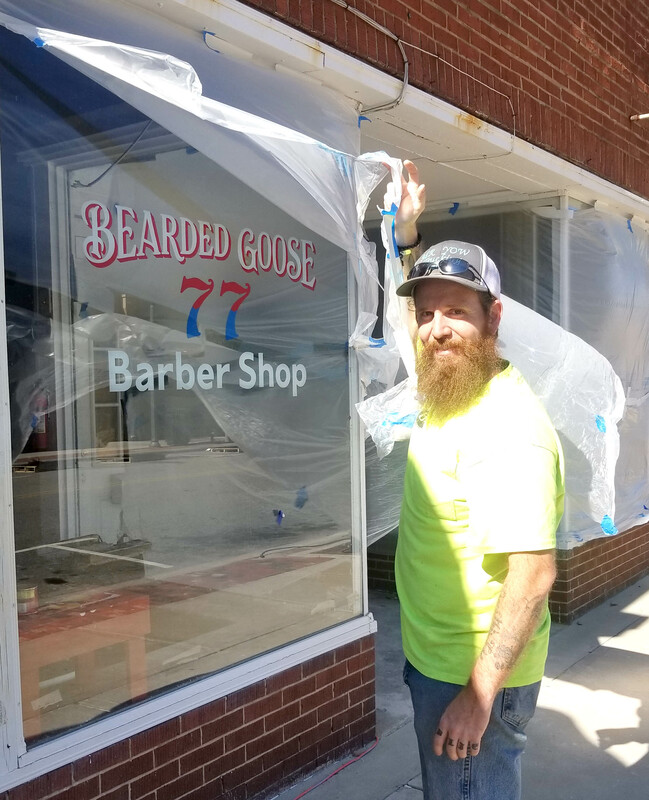 He's now on the verge of completing the program - and opening his own business, the Bearded Goose 77 Barber Shop in Downtown Dunn. "The overall experience in the Barbering program was very positive for me. The foundation for our craft is so important and without a proven program to build on, I would not be in the position I am in now as a shop owner," said Graham. Arthur McCullers, CCCC Lead Barbering Instructor, said of Graham: "Biff was not only a great student, he was also a great friend, mentor, and brother to his fellow classmates. He had no problem with taking the time and sharing his life experiences with his fellow classmates. He would often give them encouraging words. If anyone needed help studying, he was their study partner -- he was never too busy. Watching Biff grow as a barber from an instructor standpoint has been a great joy. He has taken and implemented the tools of the trade that he gained from the Central Carolina Community College Barbering program and created what I think to be a successful business for the Dunn community. We look forward to seeing Biff accomplish all of his goals in the near future." Graham said the idea for the barbershop came very early in his school journey. "I knew what type of shop I wanted to work in and be a part of," said Graham, who noted that the Bearded Goose 77 Barber Shop was created as a traditional barbershop where customer service engulfs every greeting, every service, and every action. How did Graham come up with the Bearded Goose name for his new business? According to the Bearded Goose 77 Barber Shop website: "Prior to attending barber school, Biff was a professional driver for a local trucking company. During his time as a truck driver, he was given the name Bearded Goose from a fellow driver because of the type of trailers he delivered loads with, and the beard that he grew after 20 years of shaving daily. Once the decision was made to open a shop, the name was obvious. Also having close ties with Biff's Scottish heritage, the name expresses the style and tradition of naming shops and pubs in the old country." There is little hesitation about establishing the business. "The only hesitation that I had was the possibility of finding the right team to work in the shop. The market in my area needed and wanted something different, so having clientele never was a concern," said Graham. "After visiting many shops, I knew there were like minded people that had the same work ethic and passion for the craft. With that conclusion, I knew that the team would be easily assembled." In planning for his new business, Graham once again looked to Central Carolina Community College - and its Small Business Center in Dunn. "The Small Business Center was a pivotal resource during the entire process -- from the business plan strategy to helping me partner with local business," said Graham. "The Small Business Center is by far the most underused asset small business owners use. The willingness to assist, the knowledge of what it takes to start and run a business was such a vital part of getting my business off the ground. They answered all my questions and guided me through the process. That being said, you have to put the effort in to be successful." Mari-inetta Pavlic, CCCC Small Business Center Coordinator in Harnett County, said she is excited to see Graham begin his business in Dunn. "He is an exceptional person who has put in the hard work to succeed," she said. "The Small Business Center's mission is to increase the success rate and the number of viable small businesses in the county by providing high quality, readily accessible assistance to prospective and existing small business owners and their employees. Biff, owner of Bearded Goose 77 Barbershop, has recognized the importance of the SBC and has utilized its resources to help his business begin in a supportive community." Graham believes key factors to any business is keeping a positive mindset and believing in what you are creating. "My passion runs deep in anything I put my name on," he said. What advice would he give to someone who may be considering establishing a business? "Research, plan, strategize, plan again," said Graham. "Use all resources that are available to you." For more information on Central Carolina Community College and its programs, visit www.cccc.edu.